Santa is celebrating Christmas at the North Pole. He is waiting with his Mistletoe for Mrs Claus to return from her Christmas shopping. Santa is shown against a dark wintery back ground with his Gingerbread style cottage home and a very Festive Christmas tree in the background. The bauble also has fringe-work lavished with beaded North Poles and Christmas Trees including Fire Polished beads around the bottom! This bead pattern is made using Japanese Miyuki size 11 Delica beads and peyote or brick stitch can be used. It is assumed the beader will be familiar with either Brick, Peyote or Both. Peyote and Brick stitch bead instructions are available free on www.threadabead.com. Please note the pattern may not work with any other size and type of beads. There are 14 delica colours in total and the finished beadwork is approximately 3cm x 6.5cm. 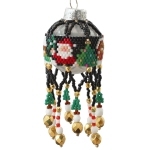 Each bead pattern is mounted on a 3cm bauble. 16 x 2mm Siam, 16 x 2mm Chalk White, 8 x 4mm Chalk White, 20 x 3mm Gold Plated and 8 x 6mm Gold Plated Fire polished Beads are required for the fringe-work. (please note almost any beads around 3-5 mm would work though) The pattern supplied is 16 pages and includes close up photo of the finished work, a colour chart of suggested delicas, a colour pattern, a numbered coloured pattern and assembly instructions (including fringe-work instructions).